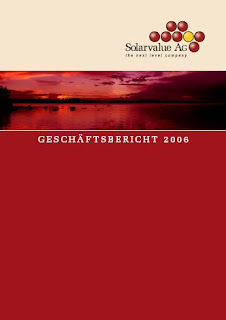 For no particular reason, I checked the Solarvalue AG (XETRA:SV7) website this evening, and I stumbled on this German only release of their 2006 Annual Report, Geschäftsbericht 2006 zum Download. The German version may have been released on March 29, 2007? The English link to the same report has April 18, 2007, as the release date. This report shows how important it was for Solarvalue to land a strategic partner (Solarvalue goes “Back to the Future” with Moser Baer Photo Voltaic partnership). Solarvalue had total assets of about €1.622 million at 2006 year end and working capital requirements of €15 million to get solar grade silicon production going at the TDR Ruše facility in 2007. I assume shareholders have received or will receive a copy of the annual report and the 22 page invitation proxy statement to the shareholder meeting in the mail. I didn’t like get the memo on this one. There is also a counter proposal or objection to Item 8. in the proxy statement from xpensio GmbH. Item 8. appears to deal with increasing capital stock and related bylaws. German version has NOT been released in March. I tried SEVERAL times to get a copy – to no avail. For some reason they tried to hide their Annual Report as long as possible. We will soon find out why. gunther, do you have any insight into this annual report. as far as i can tell, they don’t appear to be releasing it in english and i don’t speak german. by CEO Claudia Boehringer at the Annual Shareholder’s Meeting.